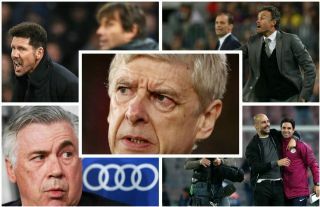 Arsenal have today been linked with four potential candidates to replace Arsene Wenger as manager next season as the club plan to review the current boss’ position. It’s been another nightmarish campaign at the Emirates Stadium, with the Gunners feeble in defeat to Manchester City at the weekend as another trophy slipped away from them as they went down 3-0 in the Carabao Cup final. Arsenal look in urgent need of change and have done for some time, but it will take someone pretty special to turn things around at a club that has largely been sleepwalking through mediocrity for much of the last decade. The Daily Mirror have claimed that the four names on Arsenal’s radar at the moment are Leonardo Jardim, Brendan Rodgers, Joachim Low and Mikel Arteta. With respect to the four names mentioned, none are exactly going to blow fans away and it’s debatable if any of them are truly up to the size of the challenge waiting in north London. A superb managerial mind and strict disciplinarian with an eye for organisation and detail when it comes to defending, Diego Simeone seems the ideal response to Wenger’s reign. The Argentine would add some much-needed steel and resilience to this squad, and has shown with Atletico Madrid that he doesn’t need a huge transfer budget with which to work miracles. Against the financial might of Real Madrid and Barcelona, Simeone led Atletico to the La Liga title in 2013/14 as well as two Champions League finals. You’d have to think he would have an even easier time of things making it work with a club of Arsenal’s resources. A slightly underrated figure in the game due to being seen as simply picking up where Antonio Conte left off at Juventus, there can be no doubting Massimiliano Allegri’s quality. The Italian tactician has helped turn around Juve’s fortunes in Europe and arguably has the club playing a more attractive brand of football than under Conte, taking them to the next level in their status as a European super-power. Of course, it’s a different task altogether at Arsenal, but to think like a member of the elite you need someone from that elite in charge, so Allegri could well be that man.